Frontiers and Identities: Cities in Regions and Nations, Pisa, 2008, pp. 75-86. This chapter focuses on the spatial analysis of intra-urban territories which existed in late medieval and early modern Brussels (Belgium). By studying their morphological characteristics and origins, I seek to understand their functions within urban society. These intra-urban territories did not have clear or stable frontiers, unless they were demarcated by town walls. he territories were deined by a chain of loose spatial elements. he town council used them to organise urban defence and to apply fiscal and commercial rules. herefore, they were created ex nihilo, revealing the divide et impera policy of the town council. 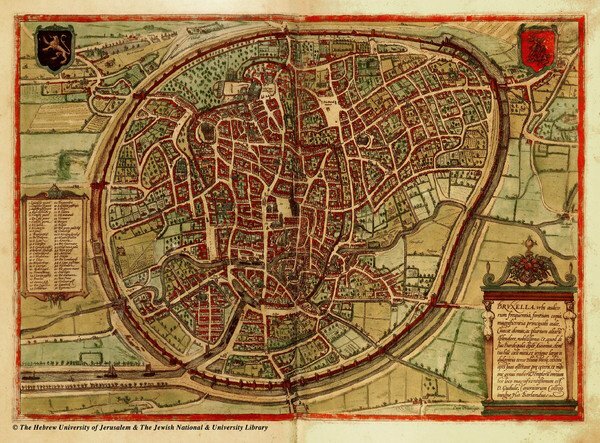 Throughout history, cities have been described in many ways. Some authors enumerate the most striking properties and qualities of the city. Other writers conceive of cities as conglomerations of significant buildings and structures (e.g. city halls, churches, town walls, palaces, important roads and markets). In both approaches the city is reduced to its most characteristic elements. Other aspects of the urban experience remained unstudied although they were certainly characterized by speciic particularities. During the 18th century, some guides and chronicles of Brussels tried to ill this gap by describing the different parts of the city one by one. he ‘advertisement’ for the readers of such an edition clearly indicated that the inhabitants of large cities oten ignored the things that made their city famous. Because of improvements in statistical methods and administrative practice, the entire urban surface could more easily be grasped in one single approach. Yet, this kind of description and analysis oten risks being static and colourless.